Built from the ground up to accommodate today’s dynamic, fluid teaming, StandOut is built to help organizations build more teams like their best teams — by serving the team leader. Unlike other solutions that simply collect data, hand it over to the C-Suite, and say, “good luck,” StandOut provides real-time, reliable data that team leaders can act on. 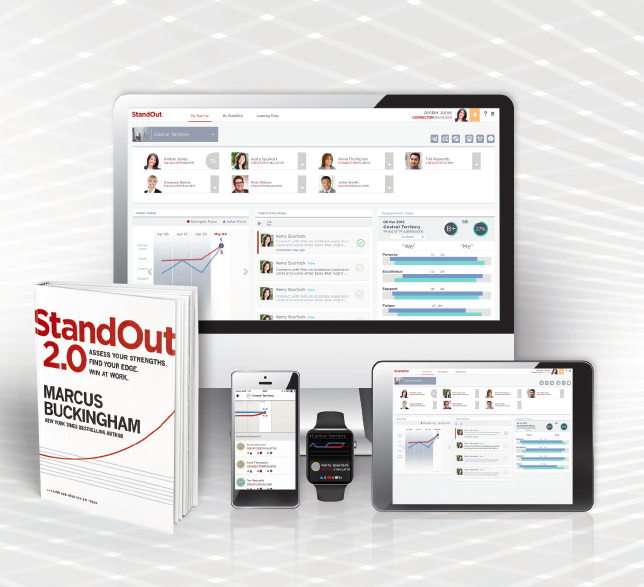 And as if that weren’t enough, StandOut also gives team leaders practical real-world strategies — calibrated to their own personal strengths — to make their teams better, faster. In short, StandOut uses machine learning algorithms to bottle the practices of the world’s greatest team leaders and offers them up to exactly the right people at exactly the right time, so that organizations can fuel engagement and drive performance not from the top down, but exactly where the action happens: leader by leader, team by team. To learn more about StandOut technology, education, and coaching, and how they can transform your organization, contact us today.